It's no secret that I absolutely love diy projects and chalkboard paint. So it should come as no surprise that when I get the chance to combine the two, the possibilities are endless. I've been wanting to paint something with chalkboard paint for the longest, and this weekend, I finally had the opportunity. So check out my super simple, yet completely adorable chalkboard painted wine bottle. Isn't it just adorable!! It's great for decorating your home, or weddings, party's and things of that nature. Plus, it was super super easy to make. First just remove the label from the bottle. If you are unsure of how to do this, check out my post last week about removing labels from bottles. 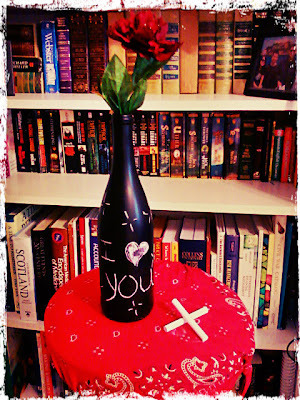 Then paint the bottle with one coat of chalkboard paint, and let that dry. Then finish it up with another coat, let that dry for about 5 hours, and then viola, you're done. Now you get to decorate it, and doodle until your heart is content. Enjoy! BTW, if you're here visiting from the hop, be sure to scroll down a few posts and enter to win a $25.00 Forever 21 Gift Card + Ad Space with me for the month of September! Thanks Megan. If you do a post, make sure you swing back by and drop me a link so I can come check it out!! These are awesome! AND super cute! Love this idea!